Stephen King is now and will forever be one of the great masters of horror in any medium. The man has crafted some of the most enduring and haunting tales that history will ever know. 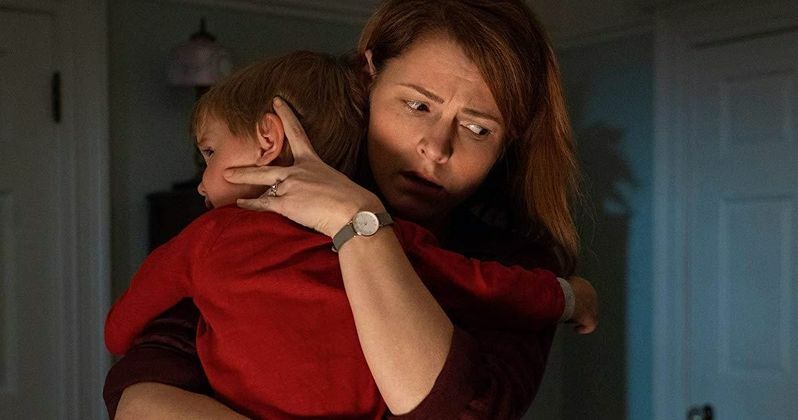 One of those tales, Pet Sematary, has been reimagined once again for the big screen 30 years after Mary Lambert delivered her version to the world in 1989. While it's not a female behind the camera this time, with Kevin Kolsch and Dennis Widmyer (Starry Eyes) handling directing duties, there is a very strong female presence from a very accomplished female filmmaker in Amy Seimetz. Even genre fans who aren't familiar with her by name surely know the work of Amy Seimetz. Seimetz has starred in movies like You're Next, Upstream Color and Alien: Covenant, just to name a few. She's a filmmaker herself, having directed several shorts, 2012's Sun Don't Shine, as well as several episodes of The Girlfriend Experience and the FX hit Atlanta. In this case, Seimetz is lending her talents in front of the camera as Rachel, mother of the Creed family at the center of this classic Stephen King story, who have to learn the hard way that, sometimes, dead is better. It's a great time to be a horror fan. Studios are taking the genre quite seriously these days and, that's not to say they didn't always see the value in horror. It's always been a cash cow genre, but there's an understanding currently about handling these projects the right way. Treat them with respect. Let visionary filmmakers do their thing. That's exactly what's happened with the new adaptation of Stephen King's Pet Sematary. Kevin Kolsch and Dennis Widmyer have crafted something truly unique with a distinctive vision that stays true to the source material but very much stands on its own two feet. It fits right alongside IT as an A-class Stephen King adaptation in the modern era. Amy Seimetz is no small part of what makes this movie work. I was lucky enough to catch the premiere screening of Pet Sematary recently at SXSW in Austin, Texas. I was doubly lucky to have the chance to chat with the actress in question following the screening about the movie, her career and her lifelong love affair with horror in general. So without further adieu, here's my chat with Amy Seimetz. I'm assuming last night was the first time you've seen it with an audience. So how are you feeling now that it's kind of out in the world? Amy Seimetz: It was really fun. In addition to it being the first time I saw it I, as a filmmaker, grew up at this festival. I think the first SXSW I came to was in 2007. So, to be here with a film like this, it feels like home but it's also like, "Whoa! This is crazy!" Coming here with Pet Sematary? I started with $10,000 feature films. That felt really amazing, and also my sister was sitting next to me. I've gotta rewatch the movie because I was really entertained with her hiding her eyes and saying, "No, no, no, no, no, no, no. Don't do that!" Even though I'm sitting next to her. Also because she and I grew up watching horror films. So it's really fun to be like, my sister is watching me do the things that we used to cathartically do as kids. But also, genre film screenings are so fun because the language is so ingrained and that's what's fun about it. You know dread is coming, so their interaction with everything is just so vocal. It's like a giant party. I always say you should see horror movies with an audience because it's sort of like going on a roller coaster, right? Amy Seimetz: Since I was little, yeah. For me, You're Next is big for me, I loved Alien: Covenant. Now this. You're sort of becoming a bit of a scream queen. Amy Seimetz: Yeah! Accidentally. The filmmakers, because I also direct, the filmmakers that I've met along the way, there is this resurgence of new horror and a lot of them are doing interesting things with it. I've been lucky enough to work with Adam Wingard for, not just You're Next but A Horrible Way to Die, and Ti West. Even in the sci-fi realm. You can do so much with genre that you can't really get away with in straight drama. I'm just a weirdo, so I sort of understand where they're coming from and so I think that's sort of the match that happens. My films that I make are dark topics so it's sort of like, "Okay well, she gets it." There is a huge resurgence in horror right now but, specifically, it feels like there is something in the water with Stephen King stuff right now where it's just working out. At what point did this come your way and what was it about their take where you were like, "Okay, let's do this?" Amy Seimetz: Well, I loved Starry Eyes because I'm very aware of independent stuff that's going on. I really liked Starry Eyes. Again, in the way that genre is the greatest, and my favorite genre films is when they don't take themselves too seriously. That's part of it. But also, somebody who can craft, ratchet up tension, and play with tone, and maintain that tone, while still having a sense of humor about it is so hard. They did that so well. Dennis and Kevin did that so well in Starry Eyes, which is this scrappy movie that they did but it maintains its tone and still has a sense of humor about it. Even The Shining has a sense of humor about it. It's very dark. Amy Seimetz: That's my style. That was one of the biggest elements of agreeing to do it. Also, I mean, it's Stephen King, so I, of course, wanted to do it. At the same time knowing that a script is a script and it can be really well written, but it's broken or it's made with the direction. You can make a really good script bad with bad direction, or you can make a really bad script good with good direction. Especially since the reception coming out of that screening so far has been so great, for you, as a lifelong horror fan, what does that mean to you to now be involved in a cemented piece of Stephen King history? Amy Seimetz: I haven't really quite processed it to be honest. It's very surreal. The thing that grounds it, my sister is here, the thing that grounds it is knowing I grew up with my sister watching all of these things, and reading all of these things. Because sometimes I forget. I'm a writer mostly during the day, so I sometimes forget that I'm in movies. Legitimately. I was packing and I was like, "Oh yeah, I'm in a movie." But having my sister here, it's that moment where you have to stop for a second and go, "Oh yeah, that's cool." In the most base way where you go, "Why am I not just screaming and laughing and giggling?" I'm so excited right now. It's really nice. I actually bring my sister to all of them because she's a good reminder that you should be excited for yourself. I think what happens, life is very perpetual. You don't have any time to sort of sit there [and reflect], I imagine last night was the moment where you're like, Oh! Right! Amy Seimetz: Oh yeah! It's happening! My sister is scared! Yeah. It's that. Because we didn't grow up in entertainment. We're Florida kids. Our parents aren't in entertainment. I do this all of the time. I write, I direct, I act. It's very normal to me, but I have to remember the kid that I was and being fascinated by that world, and being so obsessed with, not just horror in general, but just movies and stories and all of these things. It's really lovely to have my sister here to ground me. It is cool, right? Your sister is there. Family and loss are huge themes in this movie. You have to go, I think more than anyone in this movie, to some of the darkest, most horrible places, in more ways than one. Is that tough to shake off as an actress? Amy Seimetz: You're mining it. So you are in a dark space. I took care of my dad and I lost my dad seven years ago. This is going to sound so dark; the older you get the more pain you carry around. And you have to function. You can't be a bumbling mess. It's not like I just forget that my dad died. It comes with me every step of the way. In portraying Rachel, that's sort of exactly what her character is. If I sit there and really get indulgent about my dad, which I can do, it does become extremely crippling. In that scene [spoiler], yeah, it opens up a can of worms, but for me as the actor portraying that, oh yeah no, that was easy. I've got that in my back pocket. It's just life. It's sad whenever you're bringing it up, but at the same time there's a lot of darkness that I carry around anyways. You direct as well. Female directors are getting a big push right now and you're big into horror. Are there any horror movies maybe you've had your eyes on or any sort of existing property that you, as a director, would be interested in? Amy Seimetz: Funny you should say that. I just finished writing a horror script that, we'll see. It will get made. But I just finished writing a horror script. I have this deal at FX for TV and writing. But I don't know. Everyone asks if I would want to adapt a Stephen King. I think it needs to be Cujo because it's the first one I read. I think I have enough horror in my head that I would probably just make my own. Given the renewed interest in Stephen King, Cujo, as directed by Amy Seimetz, doesn't sound like a bad idea. As for Pet Sematary, that one is coming to a theater near you from Paramount Pictures on April 5. This interview has been edited and condensed for clarity.